There's no Ikea in my city - in my province, even. But this Ikea product on Kijiji Calgary is too far away for me to get, either. It's pick-up only. 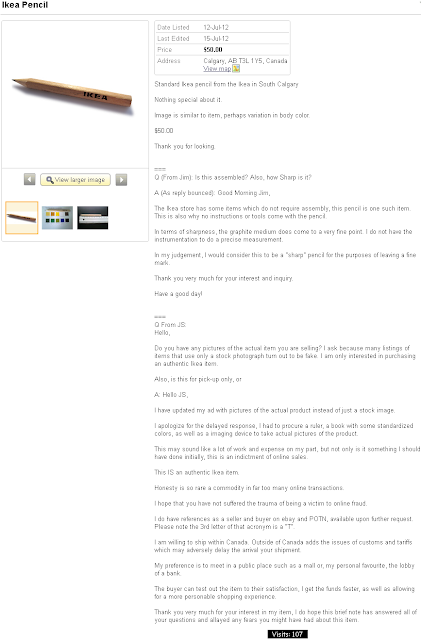 Five gold stars to this poster for being honest and explicit in his or her description of the product. Yes, it's an Ikea pencil! Image is similar to item, perhaps variation in body color. Q (From Jim): Is this assembled? Also, how Sharp is it? The Ikea store has some items which do not require assembly, this pencil is one such item. This is also why no instructions or tools come with the pencil. In terms of sharpness, the graphite medium does come to a very fine point. I do not have the instrumentation to do a precise measurement. In my judgement, I would consider this to be a "sharp" pencil for the purposes of leaving a fine mark. Do you have any pictures of the actual item you are selling? 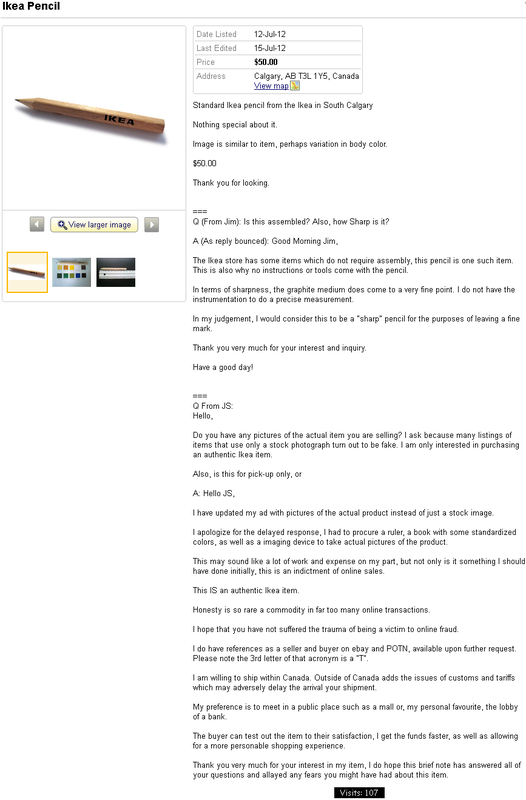 I ask because many listings of items that use only a stock photograph turn out to be fake. I am only interested in purchasing an authentic Ikea item. I have updated my ad with pictures of the actual product instead of just a stock image. I apologize for the delayed response, I had to procure a ruler, a book with some standardized colors, as well as a imaging device to take actual pictures of the product. This may sound like a lot of work and expense on my part, but not only is it something I should have done initially, this is an indictment of online sales. This IS an authentic Ikea item. Honesty is so rare a commodity in far too many online transactions. I hope that you have not suffered the trauma of being a victim to online fraud. I do have references as a seller and buyer on ebay and POTN, available upon further request. Please note the 3rd letter of that acronym is a "T". I am willing to ship within Canada. Outside of Canada adds the issues of customs and tariffs which may adversely delay the arrival your shipment. My preference is to meet in a public place such as a mall or, my personal favourite, the lobby of a bank. The buyer can test out the item to their satisfaction, I get the funds faster, as well as allowing for a more personable shopping experience. Thank you very much for your interest in my item, I do hope this brief note has answered all of your questions and allayed any fears you might have had about this item.